“Mother and Son,” − as the film critic Edward Guthmann has rightly said, − is “a dreamlike, rapturously beautiful gem about the spiritual love between a young man and his dying mother.” Told in whispers and sighs and set against a storybook landscape, it's a surpassingly emotional experience that stands completely alone among recent films. Alexander Sokurov, its Russian director, is one of the rare contemporary filmmakers, who works directly from his heart, soul and imagination − without concession to pop sensibilities. His pace is deliberately slow; the dialogue is spare, nearly incidental; the “action” is limited to hypnotic, transcendent moments of love and devotion. Utterly simple, yet profoundly meaningful and visually beautiful – every frame of it composed with the precision of a painter − all this and much more besides is expressed in hazy, manipulated images, through color, light, shadow, sound and music. It’s perhaps the Sokurov film that most clearly evokes the works of Andrei Tarkovsky, a mentor to the Russian director. The tone that the film strives to create is intended to resonate, to evoke memory and emotions within the viewer rather than express them on the screen as an example of a specific or typical mother/son relationship. Consequently, Mother and Son, remains universal, yet personal for each and every viewer. 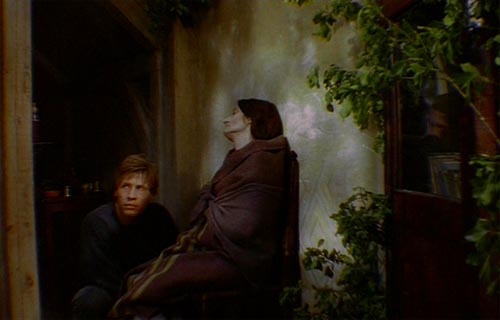 The drama is muted and the dialogue is sparse in this free of narrative, plotless and action-less story about a dutiful grown son (Aleksei Ananishnov) attending to his dying mother (Gudrun Geyer) with great tenderness in their small stone cottage that stands isolated in an idyllic country setting, where no other people are seen. Her illness is undefined and from time to time causes her great pain as she gasps for air. Her son combs her hair, feeds her, covers her with a coat, and takes her in his arms. She is totally dependent on him as he himself was once totally dependent on her. 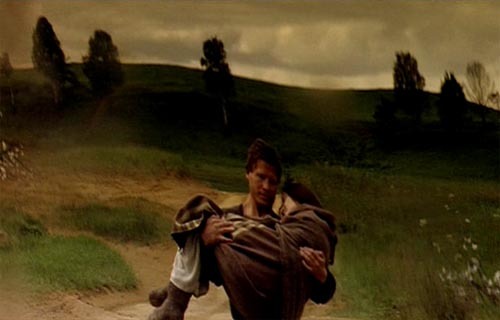 When she asks to be taken outdoors, he notes how small she has become and cradles her in his arms to carry her on a journey to the open fields. It is a circular motion, which travels a long walk through a dream-like landscape in the countryside, along winding dirt roads. At each of their brief stops on the journey is a moment of contemplation, caresses, and tender murmurs. These soft murmurs tell of the mother’s love for her son when she was nurturing him and of the son’s love for his mother as he opens for her the mysterious path to her death. They progress under the leaden and luminous ski of the Baltic, in totally isolated landscapes. From time to time, there is a far away train or a sail on the sea, emphasizing further their isolation from the rest of the world. At a nearby beach he reads an old postcard to her, in which she doesn’t identify the author when asked. They return to the house. The son tenderly lowers his mother into her bed, which now seems to resemble a coffin. Both know that the end is nearing, although he tries to reassure her to the contrary. He leaves her for a time and goes for a long, solitary walk. The son now walks in the fields alone and shows his anguish. He returns for a few last words, before she passes away. It is difficult to find a film that has captured this sense of deep intimacy and communion between a parent and an adult child. “Mother and Son” manages to express the nature of the bond between them through the autumnal landscape, through footsteps on leaves, through the wind in the trees, running water, the whistling of birds and the ominous rumbling of thunder, the elemental forces all combining with the heavy gasping breathing of the dying woman. Instead of filtering their love through irony or humor or layering it with extra sentiment and syrup, “Mother and Son” delivers pure emotion - heartbreaking and rhapsodic. Everything happens slowly in “Mother and Son.” Sokurov introduces a shot and, instead of cutting quickly to another angle, holds it on the screen, inviting us to feast on the image − to find our own dreams and meditations and touchstones inside it, to perhaps recall our own parent-child relationships. The gestures of the son are aren’t tentative, but open and encouraging and brimming with affection − like a young father caring for his child. The son strokes and nuzzles his mother, reads to her, calls her “My little one” and gently talks her out of her pain. “Mother and Son” doesn’t look like any other film. Working with cinematographer Alexei Fyodorov and taking inspiration from the German painter Caspar David Fried rich, Sokurov shoots through mirrors and panes of hand-painted glass positioned at various angles. He distorts his images to suggest the heightened, dreamlike reality of the dying mother and son. Sokurov paints with the camera, meticulously bending and softening the composition to his needs. 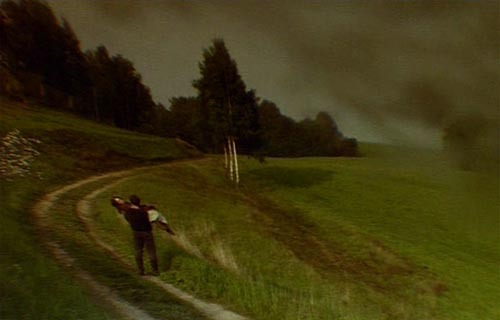 The soundtrack is equally important: Sokurov lets in the outside through sounds such as wind rustling through trees and tall grasses, thunder, the buzzing of a fly, a chirping bird, the whistle and mechanical ka-chunk of a steam train echoing in the distance. “Mother and Son” relies heavily on mood, expressionistic imagery and the sounds of nature to describe the relationship between a young man and his sick mother. 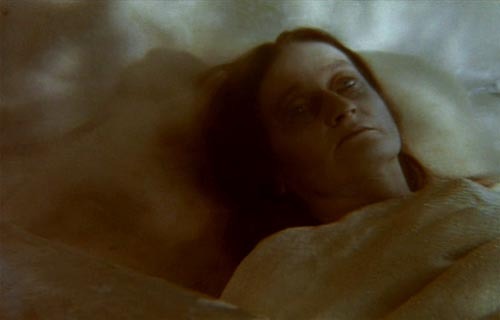 Those images and sounds take us out of the modern world with its cars and buildings and clusters of people, and create an important context for “Mother and Son” − one in which a dying woman and her son seem to float, isolated yet together, in a space between the physical world and the unknown. In a sense, Sokurov is refiguring cinema as an act of reverence − a form of visual poetry, without commercial agenda, that celebrates family love and the strength of the spirit. These are essentials of life and yet, apart from the rare work of artists like Sokurov, they’re largely ignored and often mocked by society. Expect a flushed-out story and you’ll be frustrated. Agree to be transported into a cloistered netherworld of mountains-and-valleys greenery and Sokurov’s film is something else! It’s an extraordinary trip to a terrain of hushed mystery bobbing below your consciousness. 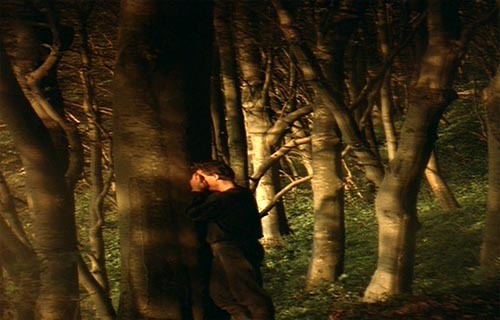 Using anamorphic camera lenses in groundbreaking ways, Sokurov creates one of the most painterly features of all times. Sokurov’s “Mother and Son” is a transcendent work of art. PGR, you have brought out the dreamy tenderness and mists of selfless love of the movie so well we felt as if we were walking through it.